Few desserts cannot be improved by a dollop of whipped cream. Though your definition of dollop might change once you taste this whipped cream. It’s kind of perfect – it’s dairy-free, vegan, paleo, sugar-free (depending how you sweeten it) and gluten-free – and definitely hard to stop eating once you’ve started. The base of this whipped cream is coconut cream, which is that thick, luxurious layer that floats to the top of a can of coconut milk. Luckily you can buy an entire can of it instead, so you don’t have to waste a ton of coconut milk to get enough cream. Whip this amazing stuff together with sweetener of choice, vanilla extract and a tiny pinch of salt and you’re good to go. Top a slice of chocolate chip cookie cake. Add a dollop on top of a homemade frappuccino or pumpkin spice latte, or even rice pudding. Put a finishing touch on a fruit crisp or mini pie. Use it to frost a cake, or a different cake. Obviously, there are plenty of ideas on the site, but I have one more coming at you tomorrow so check back in the morning! Your turn: what would you eat this whipped cream on or with?? 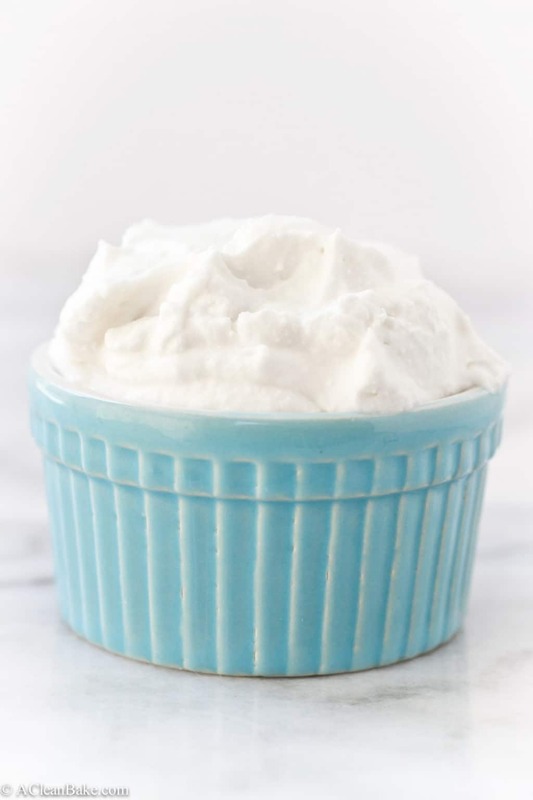 Vegan whipped cream is allergy-friendly and paleo. It takes 5 minutes to make and is so versatile that you can put it on just about anything! Make your powdered sugar: add the sweetener and tapioca to a food processor or high speed blender and pulse 10-20 times until powdered fine. Run it through a fine mesh sifter to remove clumps. Set aside. In the bowl of a stand mixer fitted with the whisk attachment, whip the coconut cream, vanilla and liquid as needed until smooth. Add the powdered sugar and salt and beat until light and fluffy. This could take anywhere from 2-5 minutes and you may need to stop a couple times to scrape down the sides and bottom of the bowl to make sure everything is completely incorporated. Serve immediately or refrigerate in an airtight container for up to 5 days. Coconut sugar works very well for making powdered sugar. I imagine you could use raw sugar or granulated honey successfully too. Stevia or monk fruit sweetener also work but they are already pretty finely ground so you will need a high speed blender to ground them finely. There are also powdered monk fruit and coconut sugar products on the market, which - if you can find them - are the best option to use here. If you are using an already-powdered sweetener, skip the tapioca starch. If you prefer things on the less-sweet side, start with 1/4 cup of the granulated sweetener and add additional sweetener 1 tablespoon at a time until it reaches your desired sweetness. This cream is really versatile! Feel free to add flavorings as desired, such as cinnamon or peppermint extract. Simply add in 1/4 teaspoon increments until you reach your desired flavor. Once the coconut cream chills in the can it also becomes a little chunky. If, once you start to whip it, it doesn't smooth out, add a bit of liquid until it reaches a creamy consistency. I used about 1 1/2 tablespoons. Make sure your coconut cream is thoroughly chilled, at least overnight, and you can feel free to chill it for several days (I typically just keep a can of cream in the back of the fridge to make it easier. This is key for thickness and texture. If your cream starts to thin out as you're working, it may be because it's warming up too quickly. Try chilling it for a couple hours and then picking up where you left off. 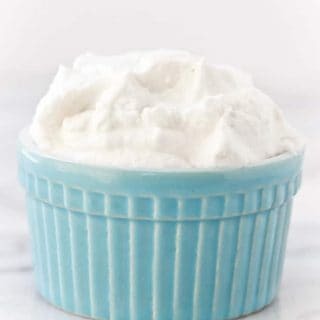 Another reason you may end up with thinner whipped cream is because different brands may vary their moisture content. I had very good luck with Savoy brand coconut cream, which is 70% cream/30% water. That brand was so thick when chilled that I have had to add liquid to thin it out! But I would imagine that different brands might differ in water content, hopefully only slightly, but it’s worth checking. If you have a can that is much more than 30% water, you can either drain the excess liquid (if it has separated) before whipping or, if that’s not possible, add a bit more tapioca to absorb the liquid. I only whipped my cream (plus vanilla) for a minute or two before adding the sugar (see: super thick cream! ), but if it hasn't begun to thicken after just a couple minutes, continue whipping it for 3-5 minutes until stiff peaks form, then folding in the sugar. Also remember: the finer you can get your sugar granules, the better for incorporating them without deflating the cream. If all else fails, and your cream turns out too thin for your intended purpose, put in a tupperware, freeze it, and you’ll have dairy-free ice cream! I’ve needed that tapioca trick! Thanks for this recipe Nora, I can’t tell you how often I just need simple basic how tos and you have some of the best! Pinned! Perfect! I’m so glad it will come in handy! I like your style, Monica! Hey Nora, I used coconut palm sugar and my whipped cream was more like soup. How long do you whip the coconut cream (and what # do you set your mixer to) before adding the sugar? I tried whipping it for 5 minutes straight after adding the sugar and tapioca but still no luck. Absolutely delicious by the way! 1) Did you chill the can of coconut cream overnight? If not, that helps immensely with texture. 2) What brand did you use? I had very good luck with Savoy brand coconut cream, which is 70% cream/30% water. That brand was so thick that I have had to add liquid to thin it out! But I would imagine that different brands might differ in water content, hopefully only slightly, but it’s worth checking. If you still have the can, the ingredient list or nutrition panel (or somewhere on the can) should say how diluted the cream is. If it’s more than 30% or so water, that may be why it got soupy. You can either drain the excess liquid (if it has separated) before whipping or, if that’s not possible, add a bit more tapioca to absorb the liquid. 3) It could also be that you added the sugar too soon. I only beat my cream (plus vanilla) for a minute or two before adding the sugar, but if that isn’t working, try whipping it for 3-5 minutes until stiff peaks form, then folding in the sugar. It’s possible that your sugar granules were larger than mine, which could have deflated the cream. I hope one of these suggestions works for you (who knew that something so simple could be so complicated to make? :)) but if all else fails, put the soupy cream in a tupperware, freeze it, and you’ll have dairy-free ice cream! Good luck! Oh! I also forgot to mention: I used a hand mixer on medium-high speed. So the equivalent on the stand mixer would be somewhere around… maybe 6-7? Is it okay to use coconut flour instead of tapioca flour in this recipe? You can try, although I would recommend sifting it first and using as little as possible. You’ll probably use less than the amount of tapioca flour that would be needed. It may be a tiny bit gritty, but shouldn’t be too bad. Will you let me know how it turns out? I’m curious!